The British book illustrator and visitor to our shores provides some stimulating criticism and asks the oft repeated question: Are they the “best” books of the year? The title Fifty Books of the Year suggests that we are to consider the selection as the fifty best books, and therefore begs the question, are they really the best? 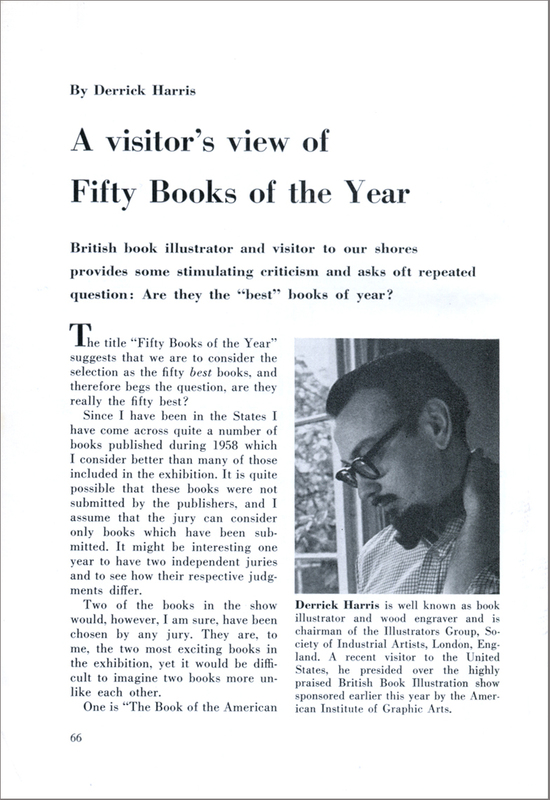 Since I have been in the States I have come across quite a number of books published during 1958 which I consider better than many of those included in the exhibition. It is quite possible that these books were not submitted by the publishers, and I assume that the jury can consider only books which have been submitted. It might be interesting one year to have two independent juries and see how their respective judgements differ. Two of the books in the show would, however, I am sure, have been chosen by any jury. They are, to me, the two most exciting books in the exhibition, yet it would be difficult to imagine two books more unlike each other. 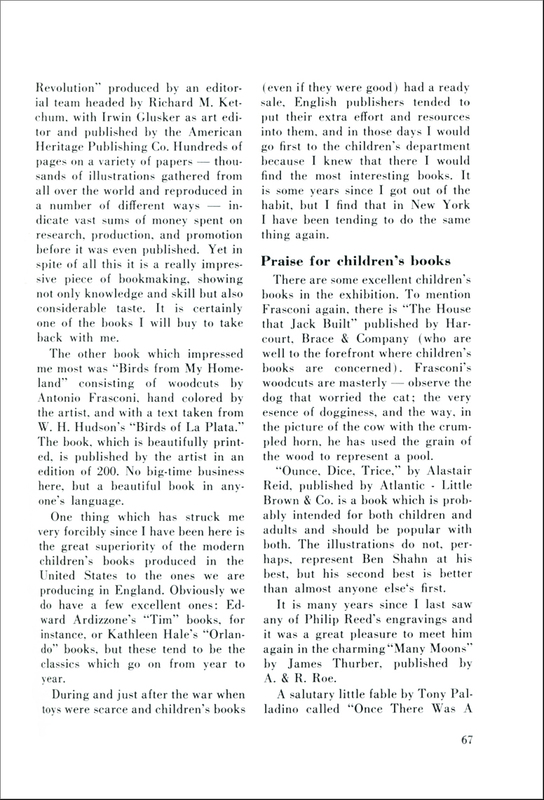 One is The Book of the American Revolution, produced by an editorial team headed by Richard M. Ketchum, with Irwin Glusker as art editor and published by the American Heritage Publishing Co. Hundreds of pages on a variety of papers – thousands of illustrations gathered from all over the world and reproduced in a number of different ways – indicate vast sums of money spent on research, production, and promotion before it was even published. Yet in spite of all this it is a really impressive piece of bookmaking, showing not only knowledge and skill but also considerable taste. It is certainly one of the books I will buy to take back with me. The other book which impressed me most was Birds from my Homeland, consisting of woodcuts by Antonio Frasconi, hand coloured by the artist, and with a text taken from W.H.Hudson’s Birds of La Plata. The book, which is beautifully printed, is published by the artist in an edition of two hundred. No bog-time business here, but a beautiful book in anyone’s language. One thing which has struck me very forcibly since I have been here is the great superiority of the modern children’s books produced in the United States to the ones we are producing in England. Obviously we do have a few excellent ones: Edward Ardizzone’s “Tim” books, for instance, or Kathleen Hale’s “Orlando” books, but these tend to be the classics which go on from year to year. During and just after the war when toys were scarce and children’s books (even if they were good) had a ready sale, English publishers tended to put their extra effort and resources into them, and in those days I would go first to the children’s department because I knew that there I would find the most interesting books. It is some years since I got out of the habit, but I find that in New York I have been tending to do the same thing again. There are some excellent children’s books in the exhibition. To mention Frasconi again, there is The House that Jack Built, published by Harcourt, Brace & Company (who are well to the forefront where children’s books are concerned). Frasconi’s woodcuts are masterly – observe the dog that worried the cat; the very essence of dogginess, and the way, in the picture of the cow with the crumpled horn, he has used the grain of the wood to represent a pool. Ounce, Dice, Trice by Alastair Reid, published by Atlantic – Little Brown & Co. is a book which is probably intended for both children and adults and should be popular with both. The illustrations do not, perhaps, represent Ben Shahn at his best, but his second best is better that almost anyone else’s first. It is many years since I last saw an of Philip Reed’s engravings and it was a great pleasure to meet him again in the charming Many Moons by James Thurber, published by A. & R. Roe. A salutary little fable by Tony Palladino called Once there was a General(published by Franklin Watts, Inc.) should be read by everyone. Including generals! 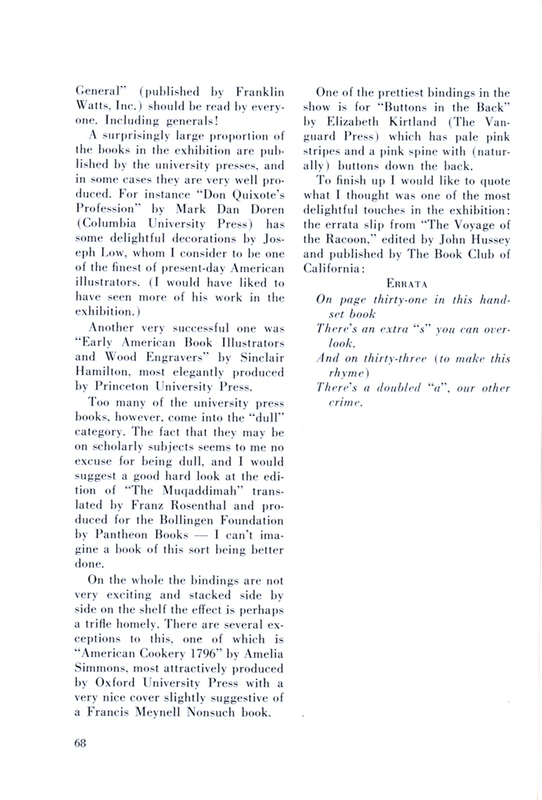 Another very successful one was Early America Book Illustrators and Wood Engravers by Sinclair Hamilton, most elegantly produced by Princeton University Press. Too many of the university press books, however, come into the ‘dull’ category. The fact that they may be on scholarly subjects seems to me no excuse for being dull, and I would suggest a good hard look at the edition fo The Muqaddimahtranslated by Franz Rosethal and produced for the Bollingen Foundation by Pantheon Books – I can’t imagine a book of this sort being better done. On the whole the bindings are not very exciting and stacked side by side on the shelf the effect is perhaps a trifle homely. There are several exceptions to this, one of which is American Cookery 1796 by Amelia Simmons, most attractively produced by Oxford University Press with a very nice cover slightly suggestive of a Francis Meynell Nonsuch book. One of the prettiest bindings in the show is for Buttons in the Back by Elizabeth Kirtland (The Vanguard Press) which has pale pink stripes and a pink spine with (naturally) buttons down the back. There’s an extra “s” you can overlook. There’s a doubled “a”, our other crime. Derrick Harris is well known as book illustrator and wood engraver and is Chairman of the Illustrators Group, Society of Industrial Artists, London, England. A recent visitor to the United States, he presided over the highly praised British Book Illustration show sponsored earlier this year by the American Institute of Graphic Arts.